“Talent supply remains the number one challenge facing digital tech businesses in the UK”, this according to Tech Nation’s 2017 survey. It found that over half (55%) of employers said THIS was their main business challenge. According to Robert Half, the tech talent shortage is “no longer just an inconvenience for employers — it’s quickly becoming a significant business problem”. You seek to give your business a competitive edge when attracting customers now, more than ever, your business talent acquisition strategies need the same focus. Business growth is being driven by IT, to leverage that you need the best specialist IT talent and the best way to reach them, in a competitive talent market, is with an IT recruitment specialist. 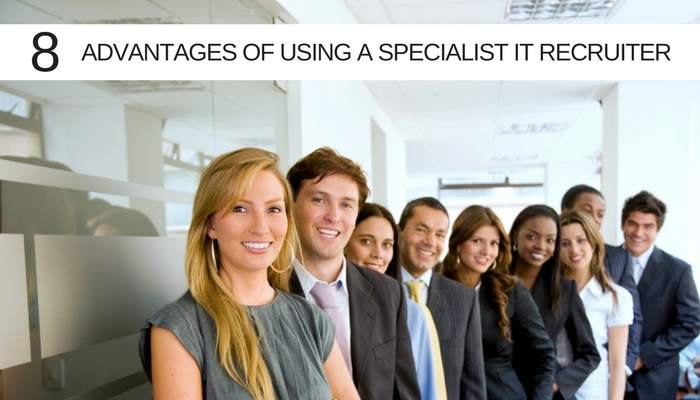 Eight Advantages a Specialist IT Recruiter Gives Your Business. Reach and speed is vital. The best specialist recruiters give you both with, for instance, a database of interviewed talent. Candidates often tell me that most general and even a lot of “technology” recruiters have very little knowledge of the actual tech that the perfect candidate will eventually work on. In an interview, while the candidate may want to talk about that technology, they are left cold by recruiters wanting to talk about the position on offer and the business generally. in a candidate-driven market, subject matter expertise goes a long way from crafting the perfect ad and role profile to ‘talking the talk’ in an interview. The days of a candidate having to stand out to get noticed by you are over. Now, it’s the other way around – it’s you that has to stand out in a crowd and it’s getting more and more crowded. Time was, as a tech employer, you’d be competing with other tech firms for the best talent but now, thanks to digitalisation, everyone is a tech employer. In just about every sector and industry, companies are dependant upon IT for delivering business objectives and to achieve that they want the same talent that you are looking for. A specialist IT recruiter knows how to sell you, your business and your industry sector to specialist IT talent. Recruitment agencies will often throw a bunch of CVs at you in the hope that something sticks. Ultimately, as a hirer you only need the one perfect candidate, so sometimes a shortlist can be unhelpful. A specialist IT recruitment partner will use knowledge of the key skills needed for a role and awareness of your business culture to filter out even close matches, leaving you with best-fit talent. At Access Talent, for instance, our assessment process is unusually robust. We carry out a competency profile on each candidate which tells you much more than you’d typically know, including how well they will fit into your company and how you can get the best out of them. It’s a rare level of insight in today’s fast-paced environment. Your best candidate may be passive right now. Let’s face it, the best IT talent is probably in a role already because, well, because they are the best IT talent! They may not be actively looking and if they are – they have a lot of options. We maintain contact with a database of specialist IT talent all the time and not just when a client is looking. This way we know, for instance, which talent’s contract is about to expire and who may be open to an approach if the right gig comes up. Back in the day, it was enough to place your vacancy on the usual job boards or maybe in the situations vacant pages of your local paper or industry journal but it’s a candidate driven market now so you have to take your vacancy to the talent. And I mean REALLY take it to them. As discussed above, your ideal candidate may not even know they’re looking for a new position so you have to convince them but first – you have to find them. Is your recruitment collateral reaching the networking sites, the right social media channels, the online discussion forums? If the answer is no then you are missing out on a huge number of potential ideal candidates. A specialist IT recruitment partner knows where the specialist IT talent is hanging out because they are hanging out there too, it’s another of the main advantages of subject matter expertise! Like most professionals, IT types look out for one another. We’ve got each other’s backs! This means that a specialist IT recruiter using subject matter experts is less likely to place a candidate in the wrong role just to make their commission. I personally only place talent with an organisation where I know that they’ll fit culturally. Placing a round peg in a square hole is not a successful placement so first it’s really important to get to know your business, how you work and the culture that you are building. ‘Best fit’ is a consideration for your prospective talent too! The last thing I want to do is place a Project Manager who lives for his family with a business with a project portfolio that demands late nights and weekends. Your recruitment partner’s attitude to shared risk can tell you a lot about their attitude to finding the right candidate. They will want to be paid for placing the right talent with you, that’s their business and like you, they have overheads and bills to pay. So at what point should you be expected to hand over the fee? Upfront? How do you know that the hire will stick before your recruiter has even cast the net? I’m amazed how many recruiters still operate in this way, OK, most will offer some kind of rebate scheme if things don’t work out – but what a hassle! What if your IT recruitment partner’s commercial model demonstrated more confidence in their ability to match candidates with your business need? What if getting paid by you actually depended upon it? ‘Shared risk’ sharpens the recruiter’s mind. For instance, at Access Talent you pay no retainers or upfront costs and fees are spread over equal monthly instalments during the first nine months of a candidate’s employment with you and if the candidate leaves, your payments stop. No questions asked. A bad hire makes no business sense for you and it should be the same for your recruiter. Hiring new people is a risk and the level to which a recruiter is committed to placing the right talent can be gauged, I think, in how much they’ll share that risk with you. In conclusion, technology is moving so fast. Businesses are using IT to scale operations faster than ever and thanks to advances in technology they are more streamlined and more efficient than ever too. IT drives growth in your business but it is your people that drive your IT. To gain a considerable advantage in the war for customers, first, you must win the war for the best IT talent and at a time when “Talent supply remains the number one challenge” it makes sense to have the best specialist recruitment partner on your side. Previous What Makes the Perfect Project Manager?